Crispy Breaded Tofu Steaks - The Co.
*WARNING: demanding, excited, tofu cook ahead. Look at that tofu. Seriously. Look at it. LOOK AT IT!!!!!!!!!! That my friends is a tofu steak, and that my friends, is what makes this girl pretty damn excited. Yeah this vegan chick gets excited about tofu… some stereotypes I just can’t fight. Sigh. But seriously, tell me you aren’t excited by the gloriousness featured in these photos! 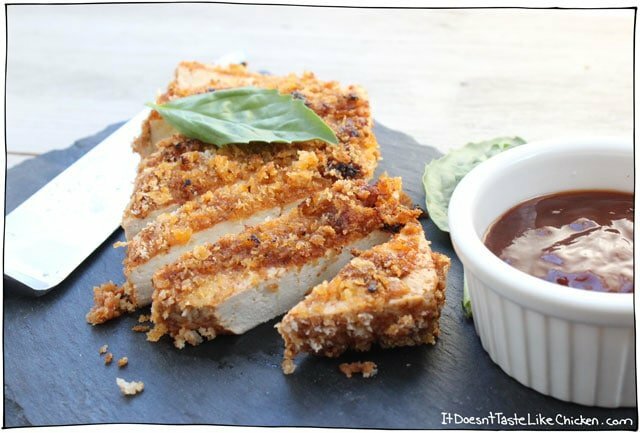 The moist and tender tofu, the zingy tomato marinade, the crispy breadcrumb coating, why am I not eating it all over again right now!? I ate an ENTIRE block of tofu in one day when I made this recipe. To the point where I am now picking leftover breadcrumbs out of the frying pan first thing in the morning, so that I can try and properly explain the flavours to you. True (slightly embarrassing) story. … but I workout, sooo ???? This is an excerpt from the article Crispy Breaded Tofu Steaks which originally appeared on http://itdoesnttastelikechicken.com/.